Regardless of the position or technique that is chosen for performing this procedure, several dictums should be thoroughly understood. First, a successful outcome is most clearly dependent on proper patient selection. A technically well-executed procedure fails if performed for the wrong reason. This may include failure of the procedure to meet the patient's expectations. Second, the patient must be properly positioned for the case to go well. Poor positioning ensures a difficult procedure. Third, simply gaining access to the hip joint is not an outstanding technical accomplish ment. 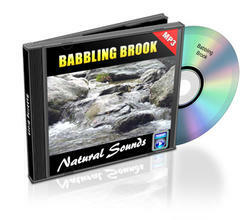 The paramount issue is accessing the joint in as atraumatic a fashion as possible. Because of the constrained architecture and dense soft tissue envelope of the hip joint, the potential for inadvertent iatrogenic scope trauma is significant and, perhaps to some extent, unavoidable. Thus, every reasonable step should be taken to keep this concern to a minimum. Perform the procedure as carefully as possible and be certain that it is being performed for the right reason. The procedure is performed as an outpatient procedure under general anesthesia. Epidural is an appropriate alternative, but an adequate motor block is required to ensure muscle relaxation. The patient is positioned supine on the fracture table. An oversized (12 cm outer diameter) formed urethane perineal post is used, positioned laterally against the medial thigh of the operative leg (Figure 10.1). Lateral-izing the perineal post adds a slight transverse component to the direction of the traction vector (Figure 10.2). It also distances the post from the area of the pudendal nerve, lessening the risk of compression neuropraxia. The operative hip is positioned in extension and approximately 25 degrees of abduction. Slight flexion might relax the capsule and facilitate distraction, but this also causes tension on the sciatic nerve, which could increase the risk of traction neuropraxia. Neutral rotation of the extremity during portal placement is important for proper orientation, but freedom of rotation of the footplate during the procedure facilitates visualization of the femoral head. The contralateral extremity is abducted as necessary to accommodate positioning of the image intensifier between the legs. Before distracting the operative hip, slight traction is applied to the nonoperative leg; this stabilizes the torso on the table and keeps the pelvis from shifting during distraction of the operative hip. FIGURE 10.1. The patient is positioned on the fracture table so that the perineal post is placed as far laterally as possible toward the operative hip resting against the medial thigh. Traction is then applied to the operative extremity and distraction of the joint confirmed by fluoro-scopic examination. Usually, about 50 lb of traction force is adequate. Sometimes more force is necessary for an especially tight hip, but this should be undertaken with caution. FIGURE 10.2. The optimal vector for distraction is oblique relative to the axis of the body and more closely coincides with the axis of the femoral neck than the femoral shaft. This oblique vector is partially created by abduction of the hip and partially accentuated by a small transverse component to the vector. Once the ability to distract the hip joint has been confirmed, the traction is released. 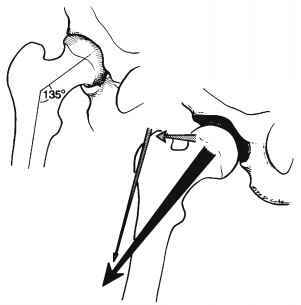 The hip is then prepped and draped and traction reapplied when ready to begin arthroscopy (Figure 10.3). The surgeon, assistant, and scrub nurse are positioned on the operative side of the patient. The monitor and arthroscopy cart with an attached sterile Mayo stand containing the video-articulated arthroscopes and power shaver are positioned on the contralateral side (Figure 10.4). Most standard fracture tables can accommodate the few specific needs of hip arthroscopy (Figure 10.5A-D). A tensiometer is a helpful tool that can be incorporated into the footplate and is especially useful for monitoring the intraoperative ability to maintain adequate distraction. A large-sized perineal post with generous padding more safely distributes the pressure on the perineum and facilitates lateralization of the operative hip. An image intensifier is used for all cases. This is important for ensuring precise portal placement. Simply accessing the joint is often not difficult. More important are care and precision in portal placement to minimize the risk of iatrogenic damage. FIGURE 10.3. 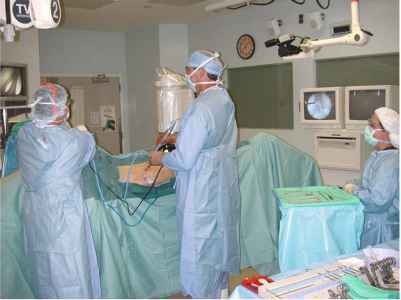 The surgeon, assistant, and scrub nurse are positioned on the operative side. The ar-throscopy cart with monitor is on the nonoperative side. The C-arm, covered with a sterile drape, is positioned between the legs with the fluoroscopic monitor at the foot. dense soft tissue envelope. The 30-degree scope provides the best view of the central portion of the ac-etabulum and femoral head and the superior portion of the acetabular fossa, whereas the 70-degree scope is best for visualizing the periphery of the joint, the acetabular labrum, and the inferior portion of the fossa. 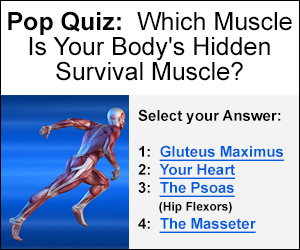 A fluid pump provides significant advantages in the hip. A high-flow system can provide optimal flow without having to use excessive pressure. This is important for visualization and safety. Adequate flow is essential for good visualization necessary to perform the procedure effectively and in an expedient manner. Flow cannot be as precisely modulated with a gravity system, creating difficulties both with visualization and extravasation. However, the surgeon must always be cognizant that the pump is functioning properly. FIGURE 10.4. 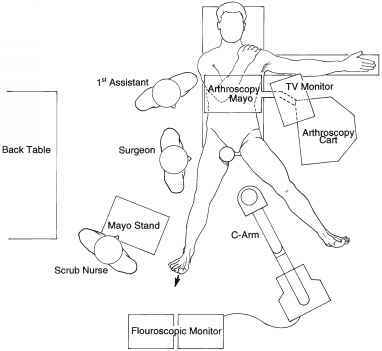 Schematic of the operating room layout showing the position of the surgeon, assistant, scrub nurse, arthroscopy cart, monitor and Mayo stand, scrub nurse's Mayo, C-arm, and back table.